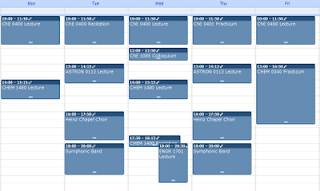 I didn't really blog about finals last semester because (1) it wasn't all that exciting, and (2) it was super-duper busy. Right back from Thanksgiving Recess on Monday 1 December, we had a major presentation to present the next day (we finished it at 03:00). Then a music exam on 3 December and a Materials exam on 5 December, all before the real Finals Week was to begin. Then it was BioChem and Transport on 9 and 10 December, respectively, before we could finally calm down. By drawing bunnies at other people's remaining exams. These grades represent a QPA of 3.208 on 18 credits, giving me an overall GPA of 3.460 on 88 credits. BioChem hurt the ChE scores a bit, but I still have 3.521 on 24 credits in my major. ASTRON 0113 Introduction to Astronomy 3 cr. ChE 0400 Reactive Process Engineering 5 cr. ChE 0401 Reactive Process Engineering Lab 1 cr. CHEM 0340 Organic Chemistry 2 Lab 1 cr. CHEM 1480 Intermediate Physical Chemistry 3 cr. ENGR 1701 Fundamentals of Nuclear Reactors 3 cr. MUSIC 0631 Symphonic Band 1 cr. Classes begin 5 January 2009; final exams are 20-25 April 2009. No classes 19 January for Martin Luther King's Birthday Observance, or 8-15 March for Spring Recess. I'm a little bit frustrated by the PChem recitation overlapping with Nuclear, because that's not how it's listed in the system, but that's how it is. Apparently some people had talked to the professor ahead of time since the original 17:00 start time conflicted with something. So the system was changed to read 17:30-17:50, but a 20-minute recitation isn't going to be useful, so we were informed that recitations will be 17:30-18:15. Of course, I know for a fact that I'm not the only one for whom that poses a problem, so maybe if enough people band together, he might add an alternate time. Other than that, everything's going well. Judging from "syllabus day," the ChE 0400 professor is definitely well-versed in effective pedagogical techniques, so she's definitely trying to help us learn. Let's just hope that that translates well into actual practice. ASTRON seems to strike the right combination of fun and challenge, at least judging from today's lecture and a quick skimming of the first homework set. Exams look to be nicely spaced. Tentatively 4, 9, 18, 26 February; 18, 23 March; 8 April; and then finals. This is a feature not many of my other semesters have been able to boast. Of course, there'll be a couple reports and a presentation in there for ChE 0401 (same as always), but hopefully I'll be able to make the best of everything. The homework is regular, too. Reactive Processes will be due Wednesdays, Astronomy on Thursdays, and, of course, the OChem labs will be due Fridays, since that's when I have it. This is also a relief. It will allow me to get into more of a routine, because I know from experience that when homework is due on seemingly random days that vary each week, I don't do well with its time-management. Random tangent 1: I like this blogging with a goal in mind. Like blogging right before midnight, trying to get the post done on time. It keeps me on my toes. Random tangent 2: I found a dime on the ground today, the first coinage picked up this year. Perhaps I should do a running count, akin to Laurel's coffee count? Yay for updates on grades. Your GPA makes me nervous, because I see many As and Bs and yet it's a 3.4. I'm so used to high school where As and Bs meant like 4.0. :-\ But my classes are much MUCH easier than yours, so I think I'm okay. I agree with you on the regular basis thing. This semester I had a journal entry due every Tuesday/Thursday for this one class, and it worked out well because I had the class at 2, so on both of those days, I would do the journal entry at 1. It worked out very well to have Journal Entry Time scheduled into my day.